Catalonia, of which Barcelona is the capitol, has a population of 7.5 million people. It encompasses a small area in Northeast Spain which borders France. This little area of the world has supplied us with some uniquely talented people. Artists the likes of Salvador Dali and Joan Miro found inspiration in this region. The great architect Antoni Gaudi of course, and Ferran Adrià i Acosta, the world famous Chef from the Costa Brava’s legendary El Bulli restaurant is from Catalan. 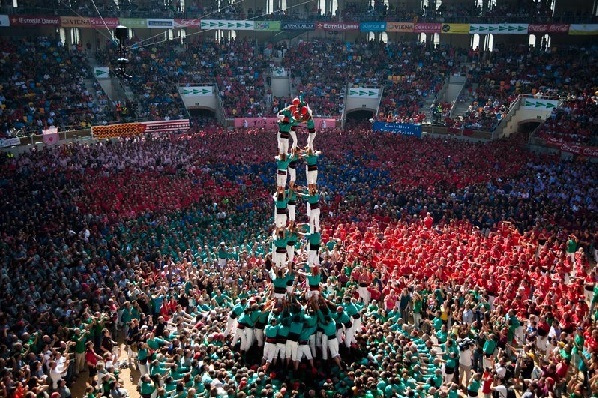 But where exactly did the inspiration for Catalonia’s unusual “Castellers”, aka Human Towers, come from? You can discover this tradition during your stay at our hotel for family in Barcelona. UNESCO calls Castellers (which means “castle-makers”) “cultural practices and expressions of intangible heritage”, and during the summer months in Barcelona you can witness this intangible, cultural expression, every Saturday evening in front of Barcelona’s cathedral to your awe and delight! The towers also occur throughout the year during festivals and special holidays. 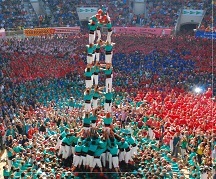 Barcelona’s human towers most likely evolved out of religious folk dances in the 15th century. Eventually their religious significance faded, but the fun of creating the towers did not and the casteller tradition continued until Franco’s time, when he outlawed them. Never the less they rose up again, pardon the pun and while it is an amateur sport, there are teams of castellers and competitions too. Comprised of men, women and children, the towers require a lot of training as each individual, in every layer of the tower, needs to take their position quite precisely and remain until the tower dismantles. The towers have three main parts. The base, the trunk and the dome. Stronger, heavier people form a base at the bottom, with the lightest people going to the top. The very top of the tower is crowned by a young person who nimbly crawls all the way up to take their place. To the beat of special music, the towers are erected. 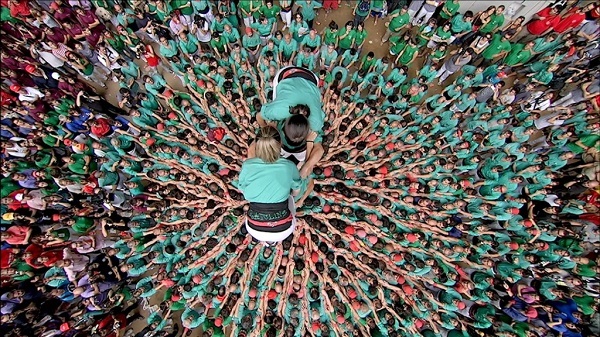 Castellers are recognizable and striking in their white pants and distinctive large black sash belt. This belt helps to protect the lower back and is useful as a foothold for climbers to upper levels. It is interesting to note that when women started to be welcomed on the teams in the 1980’s, the tower heights started to rise as the weight load was lightened. The highest ever built was ten layers high, over thirty-five feet. Of course what goes up, must come down and the disassembly of the tower is more complicated that the ascent. Once the top layers are cleared the cheering ensues and the crowd roars. 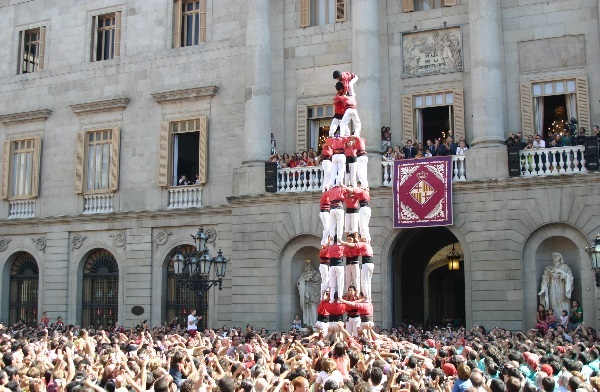 Your hotel can direct you to the best places in Barcelona to see the castellers whose motto is, “Força, Equilibri, Valor i Seny,” which means “Strength, Balance, Courage, and Common Sense.” May your own castle be built with this too!